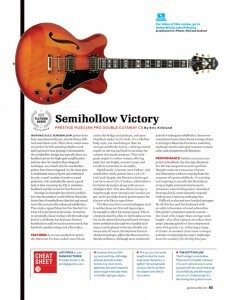 Semihollow Victory - Musician Pro Double Cutaway CS Guitar World Review - Prestige Guitars Ltd. Historically, semihollow guitars have been associated with jazz, electric blues, folkrock and classic rock. Their clean, warm tones are perfect for full-sounding rhythm work and expressive lead playing. Unfortunately, the semihollow design has typically been too feedback-prone for high-gain amplification and too slow for modern fleet-fingered technique. As a result, electric semihollow guitars have been relegated, for the most part, to traditional musical styles and embraced by only a small number of modern metal guitarists, who undoubtedly spend a good deal of time tweaking the EQ to minimize feedback and the action for fast fretwork. Prestige has brought the electric semihollow into the modern world with its Musician Series line of semihollows that feel and sound more like acoustically enhanced solidbodies. The maple-capped Musician Pro Double Cutaway CS is the latest in the series. It marries reverentially classic styling with the midrange kick of a solidbody, hot Seymour Duncan humbuckers and low action across a neck that has both a modern shape and a flat radius. As a true semihollow guitar, the Musician Pro has a solid center block under the bridge and pickups, and open chambers under each f-hole. It’s a thinline body style, not much deeper than an average solidbody electric, utilizing arched maple on the top and back to increase the volume of acoustic airspace. This widegrain maple is a softer variety, offering tight, but not bright, acoustic tones and excellent resistance to humidity. Significantly, whereas most hollow and semihollow-body guitars have a 24 3/4 inch scale length, the Musician Series guitars have one of 25 1/2 inches, which allows for better dynamics along with an overall tighter feel. This also allows strings to ring through more strongly and sustain longer, and it provides better performance for players who like to tune down. The Musician Pro’s carved mahogany neck is neither deep nor thin and tapered gently enough to allow for serious speed. This is complemented by a flat, 14-inch radius across the nicely adorned rosewood board. Sweeps, three position scales and two-handed techniques can be played with ease. Double cutaways and, of course, the Seymour Duncan JB and 59 pickups, add to the Musician Pro’s shredworthiness. Although more commonly paired in mahogany solidbodies, these over- wound neoclassics have found a unique home in Prestige’s Musician Pro Series, matching midrange muscle and rapid response to musicality and reengineered refinement. Neither cavernous nor prone to feedback, the Prestige Musician Pro DC has tempered acoustic qualities that give notes an extra sense of space and dimension without straying from the response of a great solidbody. It’s exciting and inspiring to actually feel the balance of open highs and controlled acoustic resonance when fretting notes. Instead of forming slowly, notes instantly respond with an airy, luminous midrange hue. Difficult scalar and two-handed passages fly off this fast and flat fretboard with an added dimension of tonal adrenaline. The guitar’s abundant natural sustain the result of its longer-than-average scale length—also allows players to reduce their amps’ preamp gain for a less compressed tone with greater cut. Achieving a range of classic-to-modern clean tones is simply a matter of adjusting the amp’s midrange: more for country, less for big-box jazz.